The Aussie Natural Filtration team are specialists in water filters. Perth consumers will find our team ready to answer any queries or questions you may have. Whether you want to enjoy a cool glass of water or a delicious cup of coffee, we have an excellent choice of water filter systems to suit your specific requirements. Unlike many countries around the world, tap water in Australia is generally considered free of harmful contaminants. While it is fairly safe to say that you’re not likely to catch an unpleasant illness from drinking tap water, it doesn’t mean that our tap water tastes good. As part of the disinfection process, our tap water has chlorine and chemicals added to ensure that it’s safe. Unfortunately, these additives can leave traces of chemicals in the water, affecting the taste and aesthetic qualities of our water. When our water doesn’t taste good, most of us struggle to drink enough. Water filter systems allow you to enjoy delicious, pure tasting water without needing expensive bottled water or resorting to drinking sugary sodas. At Aussie Natural Filtration, we have a massive choice of water filtration systems. We have a range of under sink filters, in-line filters and even filter taps. Some of our filters also act as a water cooler, offering delicious hot and cold drinking water. Our product range is available throughout the Perth area for homes and workplaces. Installation of our water filtration systems is easy and quick. The Aussie Natural Filtration team of trained and qualified plumbers can have your new water filter in place and ready to use with the minimal amount of disruption to your day. 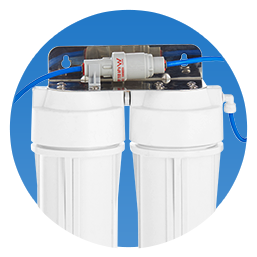 Our water filters work by passing the mains water supply through additional filtration to remove any traces of chlorine or chemicals that were added during the cleaning and filtering of the mains water supply. Regardless of the type of filter you choose, you can be sure that Aussie Natural Filtration is your water filtration specialist. 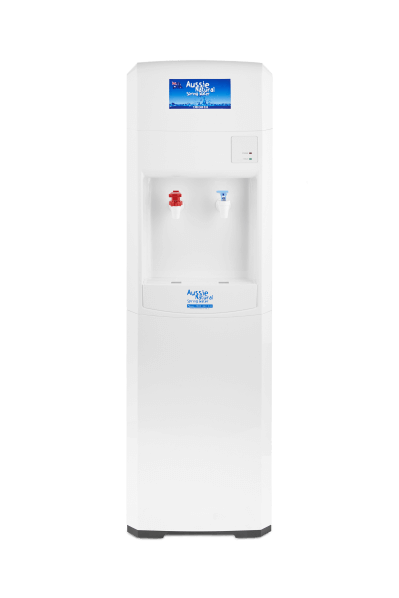 The water filter systems are available in Freestanding Hot & Cold water dispenser or Freestanding Cool & Cold water dispenser. Once again the choice is yours. Aussie Natural Filtration Systems are compact and very efficient. Like the water cooler, our water filter range only take up one square foot of floor or bench top space making them very easy to fit into a kitchen or shared workspace. Our water filter systems are compact and very efficient. Like the water cooler, our water filter range only take up one square foot of floor or bench top space making them very easy to fit into a kitchen or shared workspace. Installation of the water filter systems in Perth is quick and easy. Aussie Natural trained and qualified plumbers will have your water filter system in place and ready for action with minimal disruption to your working day. Now you can have fresh, clean water, at the temperature you want it, when you want it. There are a number of factors to determine the water filter that is right for your needs. You will need to consider the quality of your tap water. Some areas are prone to infrastructure issues that can compromise water quality. You will also need to consider which type of water filter is best suited to your needs. Some people enjoy the convenience of a hot and cold water filter dispenser, while others prefer a more discreet under sink filter. There is a fantastic range of options, but fortunately, the Aussie Natural Filtration team is here to guide you through the product range to ensure that you choose the filter best suited to your specific needs. If you would like to know more about our fantastic range of water filters, Perth consumers should speak to us. As a water filtration specialist, we are ready to answer your queries and help you to choose the water filtration systems that would be most beneficial for your home or business. Enquire Now to find out how you can get your Aussie Natural Filter delivered straight to your door.